On the day after Food Network Challenge - "SpongeBob Birthday Cakes" aired for the first time in April, we were contacted by a woman whose daughter saw Rick on TV and wanted to order a special cake to celebrate their family vacation to Hawaii. She told us her daughter had been wanting a special cake for years and had been an avid watcher of the cake challenges. We loved the idea of making a cake to honor a family's Hawaiian vacation and thought their request of a sculpted Stitch from "Lilo and Stitch" was too perfect since the movie is set in Hawaii. Earlier this week, Rick finished and we delivered their Stitch cake. 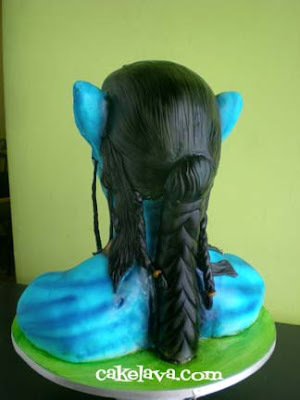 Between the Avatar (Jake Sully) cake made just a few days before and the Stitch cake, Rick and our kitchen were covered in blue for days! 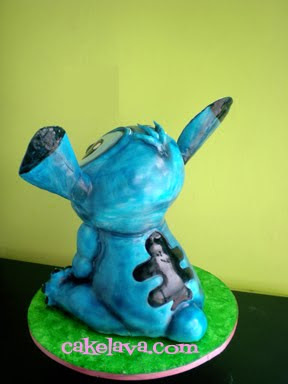 The Stitch cake was all cake, no cereal treats were used, and since he has a big head, structure was very important. The cake was brought to Duke's, one of Waikiki's most famous eateries and the place was packed. The delivery was quite interesting. 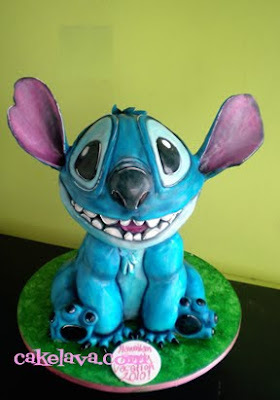 Almost immediately after stepping out of our vehicle with the cake in hand, we heard someone yell "Stitch!" and more echoes of the same name followed, and from the corner of our eye we saw people pointing and saying his name as well as the movie title. Rick had several people approach him asking him about the cake and he got many compliments. The opinion most important to us was our client and she and one of her daughter's were really impressed and excited for her other daughter to see it. That made us very happy! We hope our client and her family had a most memorable Hawaiian family vacation and have a safe trip home! Yet another cake in our list of "favorites" for the month of July. This cake was made for the wedding of Sayaka and Grant, who were married on the same day we delivered the 4 and a half foot tall wedding cake! The towering white and silver cake will be shared once we have the professional images back from the photographer. 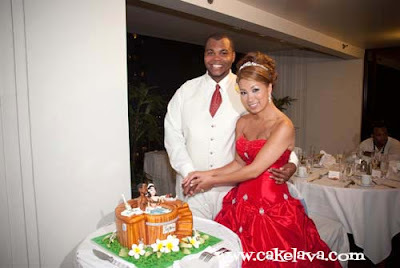 We've been excited about Grant and Sayaka's wedding cake since Rick designed it. The couple requested to use their wedding colors of gold, chocolate brown, burgundy and ivory and wanted a whimsical design with some handcrafted flowers and different patterns on the cake. They gave Rick carte blanche on the design and we were all excited about the cake once the sketch had been approved. Rick most definitely had his hands full just between Sayaka and Grant's cake and Linh and Roger's four and a half footer, both of which required MANY handcrafted flowers which he was working on for part of the week leading up to the two weddings. Aside from having great taste in their cake design, Grant and Sayaka chose some delicious, unusual flavors for the cake, Broke da Mouth, which is our mango cake with a mango li hing mui (salty dried plum) cream filling and Kona Toffee Crunch. We delivered the wedding cake to the Moana Surfrider Resort in Waikiki, and had both the staff, and the couple's coordinator, Karine France-Matsumoto impressed with the design. We were extremely pleased with it as well. Congratulations to Sayaka and Grant! 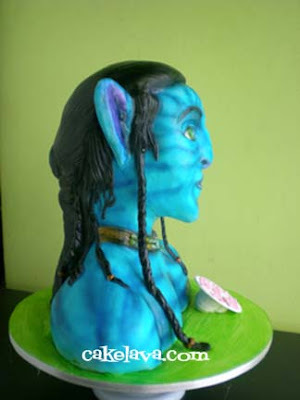 Last Saturday morning, we posted a photo of our Avatar cake on our facebook page. It was newly completed and not even the client had seen it yet. Therefore, we only showed the back of the head of the Avatar figure (see below). We didn't think at the time people would confuse the figure of Jake Sully with Neytiri, until people started posting comments and guessing which of the two of it was. We knew who it was and had not thought about that angle of mystery and quite enjoyed watching people guess who it was. For the person who said "I'll take Jake Sully for $200", you and the many others who guessed Jake, are the winners! Rick sculpted the "Jake Sully" Avatar cake for Tristan, a little boy about to turn eight and was obsessed with the movie Avatar. Had Tristan been a Trista, it could very easily have been a Neytiri in these photos. 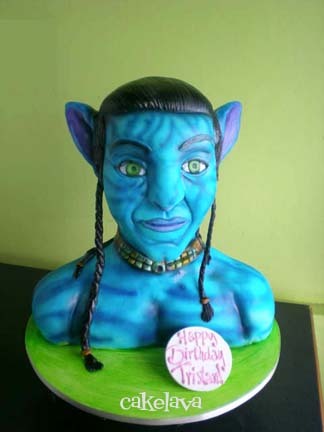 The Avatar cake was a difficult one to create. It was a character based on a real human, and perfectly blend the realistic with fantasy. It's an iconic character that must be instantly recognizable. Rick's Avatar cake is all cake and everything is hand crafted and painted. It was incredibly realistic and dimensional looking in person. It blew away our clients and we were very happy with it. We only wish we could have seen the expression on Tristan's face when he saw it! About a week ago we announced we would be making a big announcement soon. On Monday, June 28th, Rick's first class "Discover Your Inner Artist" at Icing Inspirations in Kitchener, Ontario, Canada was announced. On Friday, July 2nd, just four days later, we received notice from Icing Inspirations that his class sold out and a wait list had been started because more people were interested. Before long we were discussing options with Icing Inspirations for a second class and shortly after the decision was made to extend our visit to Canada, which was completely fine with us! We are super excited to announce Rick's SECOND "Discover Your Inner Artist" class is now available for registration through Icing Inspirations! 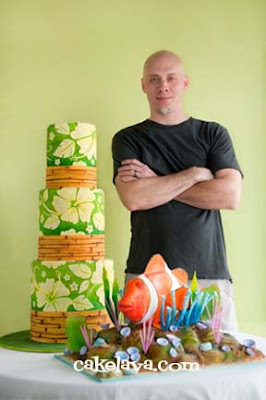 As in the first class on March 10th, 11, and 12th, 2011, Rick will be teaching students his hibiscus bamboo cake, a cakelava signature design, and a sculpted clownfish in coral composition. What he hopes to accomplish in the class is to have students become more in touch with their "inner artist" and will be demonstrating painting, sculpting, airbrushing, and freehand art techniques without the use of stencils, molds or special cutters. For more information on the class and registration, please contact Icing Inspirations directly. 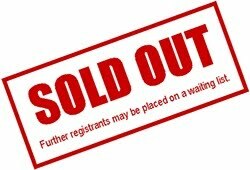 Rick has made himself available for both a weekend class (March 10th, 11th, 12th, 2011 - SOLD OUT) and now a mid-week class, which will hopefully work for those of you unable to attend the first class due to weekend scheduling conflicts. As with the first class, Rick is accepting a maximum of 15 students, and booking is first come, first served. For those of you travelling to attend the class, please contact Icing Inspirations at info@icinginspirations.ca for information on accommodations or any questions about the class. You probably wouldn't be surprised to find out one of the flavors for Laura and Justin's Hawaiian sunset wedding cake was Rainbowlicious, a cakelava signature flavor and one of our most colorful options on the menu. There wasn't an inch of this vibrant wedding cake that wasn't covered with color. Rick used the cake as his canvas for the painted sunset design and made tropical beach themed pieces -- Cute "wooden" surfboards and tiki torches sat on top, handcrafted vibrant hibiscus flowers were playfully placed around the cake, and turtles, which the couple requested, brought a touch of marine life and whimsy into the mix. 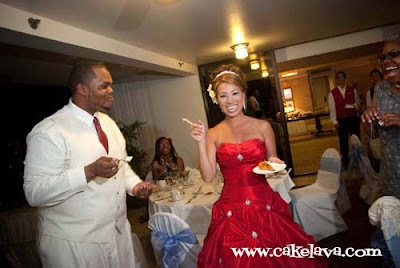 The cake caused quite a reaction both by the bride and groom, who had flown in from Australia for their wedding, and by the staff of the Sheraton Waikiki Resort, where the reception took place. I think a new record was set for the question "Is that a cake?" Laura and Justin were lovely to work with, and we wish them both the best! 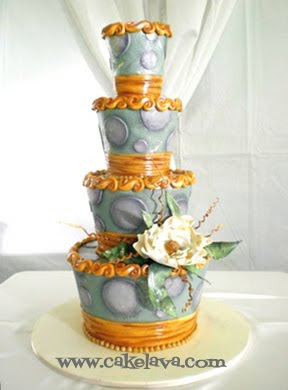 Another memorable July wedding and as with several other cakes made this month, one of our "favorites." 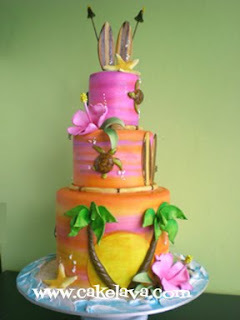 See more of our Hawaiian and beach inspired cake designs, visit cakelava.com! We've been loving the diversion over the past week with the interviews, but ultimately it's all about the cakes and our portfolio has been quickly accumulating with new designs to share. Some of our favorite new cakes are being featured in upcoming issues of Cake Central Magazine, which we're very excited about! Since the content in the magazine must be fresh, never-before-seen designs, it's something for all of us to look forward to! The month of July -- you mean it's not over yet?? -- was filled with weddings and an opportunity to work on some awesomely unique designs! Rick and I fell in love with Emily and Jonathan's wedding cake, shown above. While many were watching fireworks, enjoying barbecues and celebrating, we spent our Fourth making a 3-hour delivery out to the North Shore of Oahu, to the Loulu Palm Estate for Emily and Jonathan's wedding. The wedding was a gorgeous affair coordinated by Laura Lewis of Parasol Events and floral and decor by Yvonne Design. Everything was just perfect and their cake really complimented the decor which had a vintage/rustic feel to it. Rick designed Emily and Jonathan's cake with their colors and rustic, elegant vibe of the wedding in mind. He wanted the cake to stand as its own unique piece, to have it compliment but not necessarily match exactly the components of the wedding. He decided on 4-tiers, with unusual shapes, large polka dots and a large handcrafted flower placed on the side of the cake. It was a gorgeous design and full of flavor -- three different flavors for their guests to enjoy. Congratulations to Emily and Jonathan! We enjoyed spending our Fourth of July with you! We'd love to hear how you spent your Fourth of July. Were you baking, delivering cakes, spending time with family, watching fireworks? We hope it was one fabulous day!! Last week was "interview week" at cakelava. In the early part of the week I was finalizing my interview with Sophie and Katherine of Georgetown Cupcake, stars of TLC's new show, "DC Cupcakes" which premiered on Friday. Did everyone watch? We certainly did! 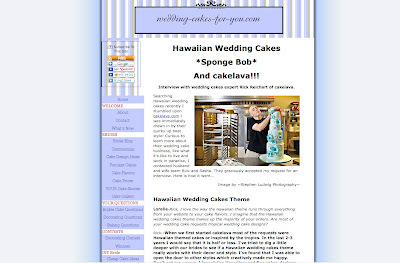 In the latter part of the week, as we're finishing up some very artistically complicated wedding cakes, I was also communicating with pastry chef/decorator Lorelie Carvey, who owns the website wedding-cakes-for-you who contacted us several weeks ago requesting an interview with Rick. Lorelie had previously interviewed a number of cake artists and designers including Anne Heap of Pink Cake Box and Sari Watkins of Toppers with Glitz among others. Rick immediately agreed to do the interview and then it was a matter of finding the time in between cakes to answer the questions. Rick enjoyed talking to Lorelie about his experience with cakes over the years. 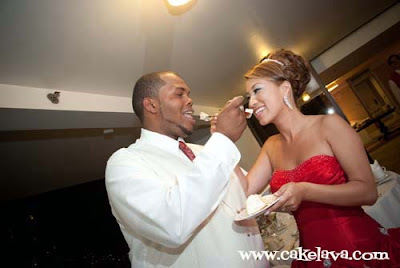 To read the full interview, visit wedding-cakes-for-you.com. Comments are always welcome! Rick and I wish to thank Lorelie Carvey for reaching out to us for the interview. We wish her the best with her wedding resource site and the cakes! Coming soon... a big announcement! Georgetown Cupcake dishes on their new TLC show "DC Cupcakes", their most bizarre creation and the popularity of Salted Caramel. Part 2 of our interview. To read Part 1 on yesterday's blog, click here. Sasha Reichart: How did you first connect with TLC? Georgetown Cupcake: A TV producer came into our shop one day to order cupcakes and saw what was going on in the back -- us lugging bags of sugar and flour, people screaming -- the chaos of it all -- and he thought it was all really entertaining. They brought it to TLC and TLC liked it and thought it was a fit! Sasha Reichart: What was it like baking, decorating, fulfilling orders, running the shop, overseeing your staff, all while cameras were filming you? Georgetown Cupcake: You really do forget the cameras are there when you have a job to do and so much to get done. You really are so in the zone of getting your work done, you don't even notice them! SR: Now for the tasty part of the interview. How many flavors do you currently offer on your menu? Who comes up with the flavors, and what is your most popular flavor? GC: We do 17 flavors each day and our menu rotates -- we have almost 70 flavors in total! We both come up with the flavors. Our most popular flavor is our Red Velvet cupcake with cream cheese frosting! 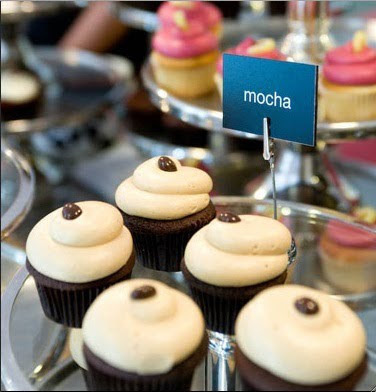 SR: What is the most bizarre cupcake creation you have ever made at Georgetown Cupcake? GC: We made a portrait of Marilyn Monroe using 1024 cupcakes!! SR: That must have been something! I know from owning a cake business with my husband that having the aroma of a freshly baked cake in the kitchen is a regular exercise in restraint. Do you regularly "sample" your cupcakes throughout the day? 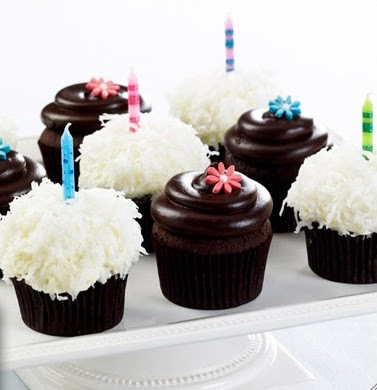 SR: For each of you, what is your favorite cupcake flavor? GC: Sophie's favorite is Chocolate Hazelnut. Katherine's two favs are Salted Caramel and Peanut Butter Fudge. SR: The bacon/maple cupcake is gaining in popularity. Do you like this flavor? What are the other trendy flavors of the moment? GC: Katherine likes the bacon/maple idea - Sophie doesn't ... this is a point of debate on the show :) Salted Caramel is really hot right now -- we love salty/sweet combinations! SR: What is the largest order for cupcakes you have ever received and what was the function for? GC: We've done 2,500 individually gift-wrapped boxed cupcakes (which was very time consuming) and we've also done 3,000 (thankfully not individually boxed) for a university homecoming. SR: Individually gift-wrapped and boxed sounds painful! Is it true you make 10,000 cupcakes on Valentine's Day? GC: Yes -- Valentine's Day is our busiest day of the year! SR: When did you open the second location in Bethesda, Maryland? Are there plans to open more? GC: We opened our second location in Bethesda in November 2009. We are thinking of opening more locations but want to keep Georgetown Cupcake a special place (not a chain) -- so stay tuned!! SR: What would you say is the Georgetown Cupcake "Recipe for Success"? GC: We are both there every day and treat Georgetown Cupcake as our "bouncing baby business" -- we care about it so much and run it with love. Hopefully that comes through to our customers! SR: What's next for Georgetown Cupcake? GC: Lots of exciting things! Right now, we are really excited for our new series on TLC! We hope that everyone enjoys watching it!! SR: We're excited about "DC Cupcakes" too! We will be watching and wishing we had one of your decadent cupcakes in our hands! I would like to thank Sophie and Katherine for graciously giving me their time during the interview. They have their hands full with thousands of cupcakes and preparing for their premiere episode of "DC Cupcakes" tonight and truly appreciate the opportunity to chat with them. I look forward to the day when I can indulge in their delicious cupcakes! Next week on the blog, more cakes! Labels: cakelava Interviews TLC's DC Cupcakes Sophie LaMontagne and Katherine Kallinis of Georgetown Cupcake, Georgetown Cupcake, TLC "DC Cupcakes"
For sisters Sophie LaMontagne and Katherine Kallinis, life is about to get a whole lot sweeter. Two years after opening their wildly successful Washington, D.C. cupcakery, Georgetown Cupcake, they are about to become television's newest baking stars courtesy of TLC's new series "DC Cupcakes." On Friday, July 16th at 10 PM (ET/PT) TLC will premiere the six-part series, revealing the inner workings of the family-owned Georgetown Cupcake. 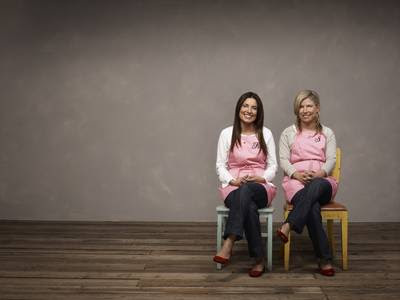 Sophie and Katherine left their high-powered careers in fashion and finance to open Washington D.C.'s first cupcakery. To their surprise, Georgetown Cupcake was an instant hit with lines forming around the block and now sells more than 5,000 cupcakes per weekday. I had an opportunity to interview Sophie and Katherine for our "Interviews from Cakeland" series via Rick's and my affiliation with the TLC Cake Crew. I viewed an advance preview of the show and visited their website, georgetowncupcake.com and was instantly intrigued by their sweet story of success. Both Sophie and Katherine graciously gave me their time and insight into the delicious world of Georgetown Cupcake, and I have nothing but respect and admiration for these two hard working entrepreneurial marvels! Sasha Reichart: You two have put DC on the map for cupcakes and currently call it home. I read that you are originally from Canada. What brought you from Canada to Washington, D.C.? Georgetown Cupcake: We both went to college in the U.S. Sophie moved from NJ to DC after college (10 years ago) for her first job and Katherine went to Marymount University, in Arlington, VA -- just outside of DC. Sasha Reichart: Georgetown Cupcake opened on Valentine's Day in 2008, a little over two years ago. Can you talk about your careers prior to owning Georgetown Cupcake? Georgetown Cupcake: Katherine worked in the fashion industry (for Gucci) and Sophie worked in venture capital. Neither of us went to culinary or pastry school. SR: Having previous experience in both the high-powered fashion industry and finance gave you a strong foundation to run a business, but where did your passion for baking come from? GC: We baked with our grandmother since we were little girls. She taught us how to bake and this was a huge part of our lives growing up. SR: What made the two of you decide you wanted to go into business together, and how did you choose cupcakes? GC: We always had a dream of opening a bakery together. We are a year and a half apart and are very close and always wanted to eventually work together in life. We decided on cupcakes because we had all of our grandmother's amazing cake recipes ... but we wanted to be able to have variety, yet still do one thing and make it awesome! So, we decided on cupcakes because we could do all these different flavors and decorations but at the end of the day, we were focusing on one thing and making it amazing! 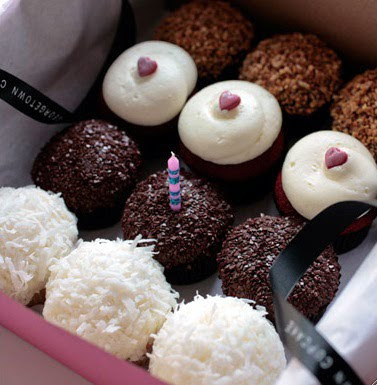 SR: I was very surprised to hear that Georgetown Cupcake was the first and only cupcakery in DC up until 2008. 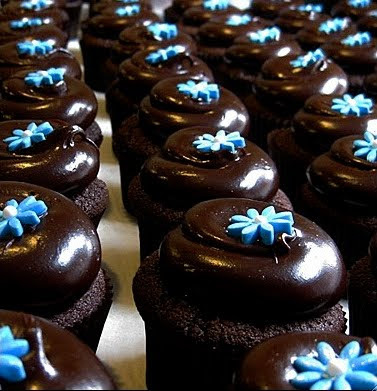 Cupcakes have been trendy in L.A., New York, Chicago and nearly every metropolitan city for years. Did you see your decision to open Georgetown Cupcake in a city without a cupcakery as more of a risk or a goldmine? GC: We really did not think about it in these terms. We really just wanted to follow through on our dream of opening a bakery together. Most people actually thought we were crazy for quitting our jobs to start a bakery together. We honestly thought it would be just the two of us -- setting our own hours, having fun baking together all day. We were SO wrong!! It ended up being crazy busy from day one! We are really lucky because our customers are AMAZING and it's great to be a part of their special events in life. 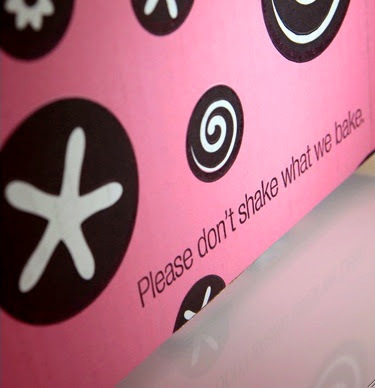 SR: Can you talk about the humble beginnings of Georgetown Cupcake? Was it just the two of you baking cupcakes and overseeing the business? SR: Approximately how many cupcakes did you bake per day when you first opened, and how many flavors did you offer at the time? GC: We baked around 1,000 cupcakes a day (15 flavors or so) back when we first opened and now we have almost 70 flavors and bake 5,000 cupcakes a day -- more on Saturdays! SR: That is an incredible amount of cupcakes! 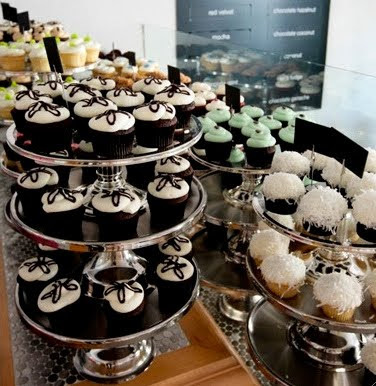 At what point in time did it really feel that Georgetown Cupcake had "arrived", and was there a particular event or order that catapulted your business? GC: On the first day we opened, we had a line down the block. When we had a line down the block on the second day too, we knew it was serious! SR: How did the word spread about Georgetown Cupcake? Did you do advertising or was it mostly word of mouth? GC: The only thing we did when we first opened was tape a Kinko's "Opening Soon" poster in the window. Sophie got in trouble from her husband for spending $50 on it :) Other than that, it was all word of mouth! SR: Amazing! I'm guessing that Sophie's husband now thinks the $50 sign was worth it! ... I was shocked to hear that Georgetown Cupcake sells more than 5,000 cupcakes a day. Five thousand! That is a lot of cupcakes. How do you manage that? GC: It adds up quickly when you do a lot of weddings and events -- 200 cupcakes here, 500 cupcakes there, etc. We bake all day long, throughout the day so everything is spaced out. This allows people to get fresh baked cupcakes all day long! SR: Your recipes came from your grandmother. You are two sisters running the business, and I'm told your mother is also involved. Combine that with 5,000 cupcakes a day and I'm guessing things can get pretty chaotic? Is there a lot of drama in your bakery? SR: There is another famous family run bakery on TLC, Carlos' Bakery. Do you see similarities between "Cake Boss" and your family business? SR: ;) I can only imagine! ... Your business catapulted nearly overnight. Two years later you are the talk of the town with a celebrity clientele and TLC knocking on your door for a new series, "DC Cupcakes". Congratulations! What can viewers expect to see in the six-part series? GC: We hope the series will give them an inside look into what it is like working in a bakery with your family as well as a behind-the-scenes look at what kinds of crazy cupcake creations we make for special events! We're just getting started with Georgetown Cupcake. Tomorrow we will continue the interview with Katherine and Sophie in Pt. 2 where we find out how their show "DC Cupcakes" came to be, what their favorite cupcake flavors are, hot new trends, largest order received and more! In the meantime, learn more the fabulous Georgetown Cupcake and their new show on TLC "DC Cupcakes" by visiting their websites, watching the cupcake video demonstrations and joining them on facebook and twitter. 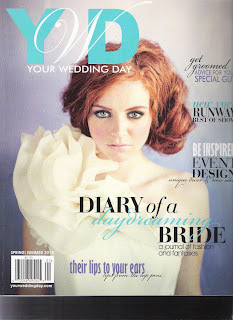 Last night after delivering our Australian couple's wedding cake in Waikiki, we headed over to Barnes & Noble and grabbed one of the last remaining copies of Your Wedding Day (YWD) Magazine, Spring/Summer 2010. We were thrilled to have found it because we've been checking ever since the magazine was released and they haven't had it in stock. 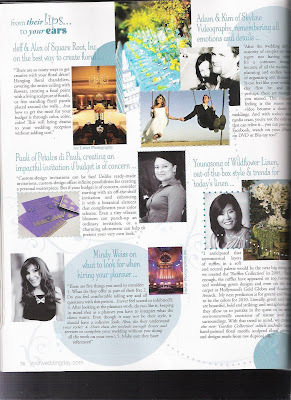 Rick was approached by Your Wedding Day Magazine a while back and asked if he would contribute to an article called "From their lips to your ears: tips from the top pros". He gladly obliged, it's Your Wedding Day afterall, and one of the most gorgeous wedding magazines around. We were honored to participate! We had not seen the article which is several pages long, until last night and honestly, the cover was so completely mesmorizing when I first saw it, I had difficulty opening the magazine. For a moment I had forgotten we were on a mission to see the article. As is typical with YWD I had to absorb each page before turning the next and when we did get to page 77 where Rick is shown with his cakes and his quote, (see photo below) we were truly excited to see the company we were in. Celebrity event designer Mindy Weiss, photographer Elizabeth Messina, Youngsong of Wildflower Linen, Linnae of Asiel Design, Linda from New York Food Company, to name just a few of the well-known industry vendors. 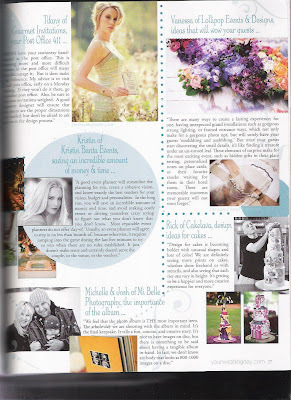 Many were vendors Rick had worked with before in L.A. and he was proud to be one of the 3 cake designers in the article. The layout of the article was just beautiful! We also wanted to give a shout-out to Joan Spitler and Leigh Grode of Cake Divas of Los Angeles who had numerous exquisite cakes in this issue. Rick and Joan used to work together in L.A. and we are very proud of all their accomplishments! Join us tomorrow for Pt. 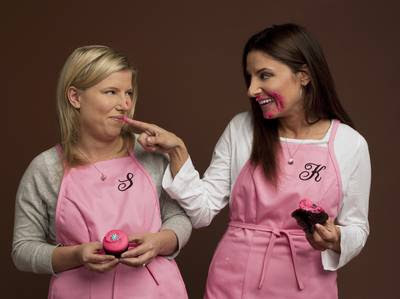 1 of my interview with Sophie LaMontagne and Katherine Kallinis of Georgetown Cupcake! Learn from these two sisters the secrets of their hugely successful D.C. cupcakery and all about their new show premiering Friday on TLC, "DC Cupcakes"! Next in the "Interviews from Cakeland" Series, Georgetown Cupcake "DC Cupcakes"
It's been months since our last Interview in the "Interviews from Cakeland" Series on the blog and I miss doing them. Cakes have happened, Life has happened, we can all relate I'm sure. My latest interview practically fell in my lap, courtesy of Rick's and my involvement in the TLC Cake Crew. One of the many benefits of being in the TLC Cake Crew is being given exclusive opportunities like advance screenings of shows, participation in contests and an opportunity to interview the talent in their shows. After seeing a sneak peek of the upcoming TLC show "DC Cupcakes" premiering Friday, July 16th at 10 PM (EST/PT) and visiting the website of Georgetown Cupcake who is the focus of the show, I jumped on the opportunity to interview sisters Sophie LaMontagne and Katherine Kallinis, owners of Georgetown Cupcake. I was dying to learn more about how the sisters started their business and how they went from making 1,000 cupcakes a day in DC's first cupcakery to 5,000, yes FIVE THOUSAND a day which they presently make. Unless the day is Valentine's Day when they make TEN THOUSAND cupcakes! Learn about their most bizarre cupcake creation as well as their favorite flavors, hottest cupcake trends and their recipe for success! Starting Thursday, July 15th we will post my 2-part interview with Sophie and Katherine on the blog. In the meantime be sure to check out their site Georgetown Cupcake and information on their new series "DC Cupcakes" on TLC. If you are in the D.C. area stop in and eat one of their luscious cupcakes. Please eat one or three for me too! To read other "Interviews from Cakeland", they are archived on our sidebar or you can click here. For the past week we've been running all over town delivering wedding cakes and each one has been drastically different than the next. The cake above was made for a couple married earlier this week at the JW Marriott Ihilani Resort. They had a vintage-inspired wedding with a color palette of ice blue and ivory/cream. 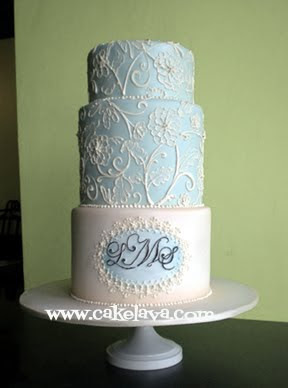 Rick's wedding cake design for the couple combined an antique lace floral pattern with a custom monogram and varied tier heights for a contemporary shape. It was soft, elegant and a beautiful marriage of vintage and contemporary elements. In Case You Missed It - Food Network Challenge: SpongeBob Birthday Cakes! The first time Food Network Challenge: SpongeBob Birthday Cakes aired was on Sunday, April 4, 2010. It was Easter Sunday and we had a private viewing party planned at Tiki's Grill & Bar in Waikiki. The last thing on our minds was marshmallow chickies and chocolate bunnies. All we could think of was SpongeBob SquarePants, Patrick Star and the rest of the gang in Bikini Bottom, and of course, Rick's competition. Rick filmed the "SpongeBob Birthday Cakes" Challenge in December 2009 with his assistant Annie, and in the months leading up to April, everything was hush-hush. We knew for months the outcome of the Challenge, and all the details, none of which could be divulged. It was agony waiting til the first airing of Challenge, and even more agonizing and exciting at the same time, that we would watch it for the first time with over 100 people who attended our private party. In case you missed Rick and Annie's Food Network Challenge "SpongeBob Birthday Cakes", it is airing again THIS weekend, July 10th at 10:00 PM ET/PT and July 11th at 1:00 AM ET/PT. Please check your local listings for times in your area. The competitors in this challenge were: Lauren Kitchens, Brownwyn Weber, Kristin Davison and Rick Reichart. Each competitor was given a character to focus on and Rick's character was SpongeBob Squarepants. We posted images taken by our awesome photographer Dave Miyamoto & Company from our viewing party previously, pt. 1 (the cakes!) and pt. 2. Today we would like to show a video of the highlights of our party made for us by our videographers Kelii and Keone Grace of Kai Media that they have graciously uploaded to vimeo. The speeches were omitted from the highlight video. As you can see, it was a laid-back, fun affair withour family, friends, clients and local wedding vendors. Rick and I would like to thank Kelii and Keone for putting together this video for us to share with all of you. Hope you enjoy! For our Fourth of July holiday weekend we saw dragons, lions and chinese takeout boxes, elegant retro styling with unusual shapes, and lots of pretty flowers. In other words, we spent the entire weekend working, but made some cakes we are very proud of. This weekend we didn't make a single birthday cake, we were booked far in advance by people wanting to celebrate the most special day of their lives over a holiday, like Ellen and Vernon, who were married on Saturday night. Ellen and Vernon booked us for their wedding cake sometime ago. 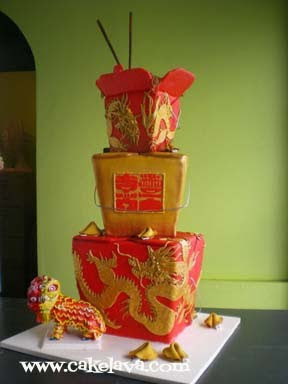 They requested stacked up Chinese takeout boxes in red and gold, to match their wedding colors. Vernon, who is part of a Chinese lion dancing group made a special request, to have a figure of a Chinese lion similar to his lion costume, which is split down the middle in red and gold colors. Rick spent a full day working on their wedding cake. Imagine the amount of work that goes into sculpting one chinese takeout box, much less 3 of them and then having to stack them up and add an elaborate dragon on two of them. The graphic on the middle tier was taken from the couple's invitation, of a stylized bride and groom figure. 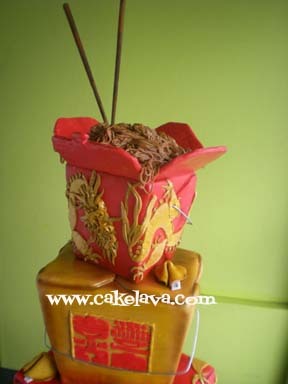 On the top tier, Rick filled the box with noodles and added chopsticks sticking out. He playfully arranged fortune cookies on and around the cake. These photos do not do this cake justice, it was far more dramatic and textural in person. 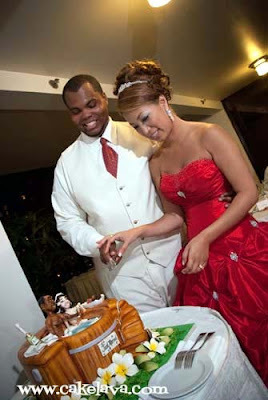 The cake was large and the couple's guest count was several hundred people. In their reception ballroom, there was red and gold everywhere, and on the side of the room was the set up for the lion dance that would be performing later. I'm sure that was quite a treat for their guests, as was the cake in their three chosen flavors Strawberries Chantilly, Kona Toffee Crunch and Chocolate Dream. Congratulations to Ellen and Vernon! 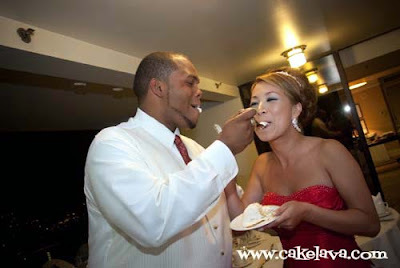 We had so much fun with Miwa and Darnell's Hot Tub Wedding Cake a couple days ago on the blog, and it appears based on your facebook comments that you did too! I received a pretty little e-package of images from their photographer Dave Miyamoto and thought their cake cutting shots were the cutest. We had to share! 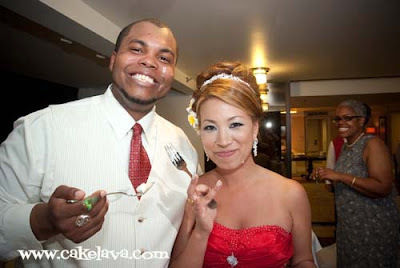 Meet our beautiful bride Miwa and her handsome groom Darnell, who took an unconventional approach to their wedding cake, and apparently, her dress. Miwa bucked the trend of wearing a white dress and went instead for a bold red color. These two were a blast to work with and I love that they never forgot the MOST important part of a wedding, to have FUN! how the heck do you cut something like this? smiling for the camera. Is that cake on their face? A big Thank You to Miwa and Darnell for including us in their special day, and to Dave Miyamoto & Company for the fabulous images! Hope you have a festive Fourth of July weekend! It felt GREAT to get the news, at the end of an 11-hour day with a five minute break for lunch, we are proud to announce that Rick's "Discover Your Inner Artist" class at Icing Inspirations in Ontario, Canada is now SOLD OUT! If you've been eyeing the class, please don't cry in your buttercream. There is always room for more! Icing Inspirations has started a wait list and they are happy to put your name on it. info@icinginspirations.ca We are so excited to come to Canada and Rick is looking forward to meeting his students! Thank you to everyone who has supported us whether you are taking the class or have congratulated Rick but cannot attend, we truly appreciate all the kind words you have left for us! Our other big news comes in the form of a brand spanking new blog, thanks to Jessica at The Frilly Coconut. What a great gal she is and really captured the fun, swanky style of cakelava. We adore our new blog and hope you do too! 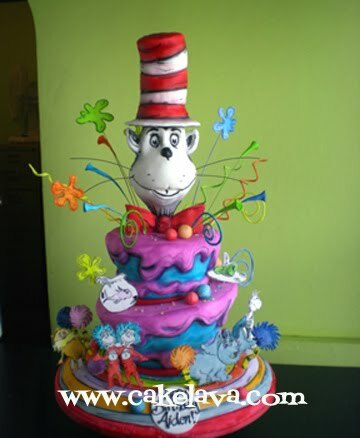 We were so excited when we got the order for the Dr. Seuss and Cat in the Hat themed birthday cake! We had worked with the client before on an Elmo and Sesame Street cake for her other son and wanted her to be just as happy with this one. We knew from the beginning her cake would contain a sculpted Cat in the Hat figure and other Dr. Suess characters would be present. She provided us a list of the characters that she was interested in, her flavors (Hot Fudge Sundae and Strawberries Chantilly) and left the rest of the design up to Rick. 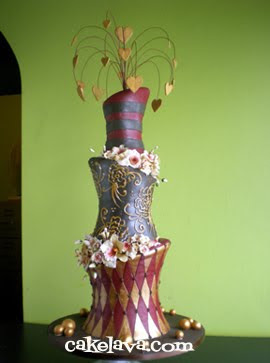 The design of her cake would have a wonky, Seussian shape and be full of color and whimsy. Honestly, other than that, Rick wasn't sure what he was going to do, until the week of the order when he did a quick sketch of the design and started making all the pieces for the cake. 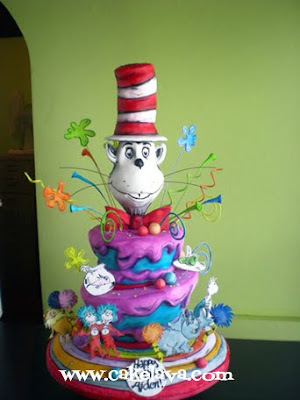 He spent a full day working on this cake, sculpting the tiers and the Cat in the Hat and finishing the design. The characters on the bottom -- Thing 1 & Thing 2, The Lorax and truffula trees, Horton and his pink clover, the fish from Cat in the Hat, the green eggs and ham, and others, were all meticulously handpainted. At the end of the day we took a step back and looked at the cake and a grin as big and goofy as any Seussian character could muster up was plastered on our faces. I said "she (the client) is going to DIE when she sees this!" We and our Cat in the Hat and Thing 1 and Thing 2 and half of Who-ville took a long drive out to their North Shore home. Each time we looked back at the cake the Cat in the Hat was grinning back at us, making us smile over and over. When we arrived at our client's home, she did just about die when she saw the cake. She and her husband greeted us wearing matching Thing 1 and Thing 2 shirts -- so cute! Their jaws dropped when they saw the cake, there was an "Oh Rick!!" in there somewhere, and they both looked incredibly happy. We felt proud of the cake and all the work was most definitely worth it! Here's hoping our Dr. Seuss Cat in the Hat cake makes you smile and puts you in a celebratory mood for the holiday weekend.